Visit Tamaki Maori Village to experience Maori culture and society as it existed in pre-European New Zealand. Through performing arts, you’ll see, hear, and feel the Tamaki brothers’ vision for an immersive tour into the traditional Maori way of life. Live the stories, travels, battles, and rituals of the Maori as New Zealand was settled. 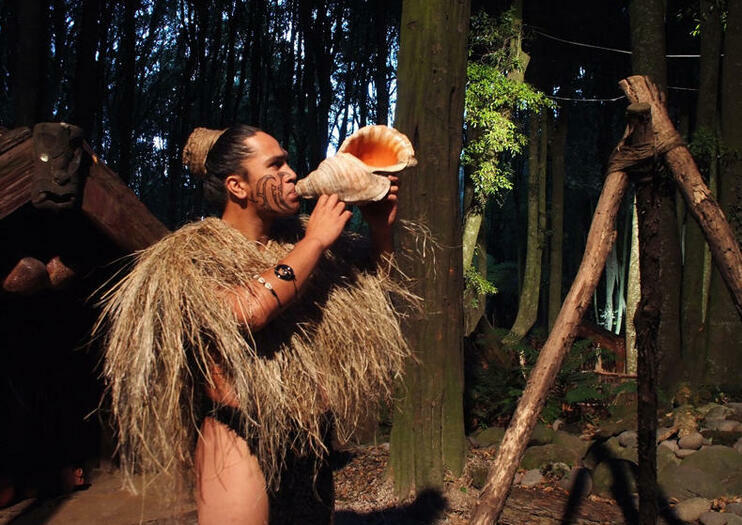 Located about 20 minutes from Rotorua, Tamaki Maori Village provides a powerful cultural performance and dining experience to show you who the Maori people are and to let you walk with them into the past. Packages include a 2- to 3-hour tour, in which your guide explains pre-European rituals (such as the powhiri welcoming ceremony), demonstrates the meeting house and interactive village in native forest, and serves a traditional Hangi feast (food cooked underground on hot stones). You even have the option to stay overnight. Visits to Tamaki Maori Village are included in many day trips from Tauranga as well as multi-day excursions from Auckland. Packages often include the village plus Waitomo Caves, the Hobbiton movie set, and points of interest in Rotorua. The Tamaki Maori Village is suitable for all ages. The venue is wheelchair and stroller accessible. Don’t forget to take a camera or charge your phone! There’s a lot to see. Take warm clothes if you travel in winter and comfortable footwear in all seasons. Hangi is for everyone: special dietary options available. The evening tour runs a bus that collects you in the early evening, around 5:30pm, from your Rotorua accommodation or from the Tamaki Heritage Experiences office at 1220 Hinemaru Street in the central city. The bus also returns along the same route at about 9:30pm. There’s plenty of space to park if you’re driving. The village is open seven days a week, so to miss the crowds, consider attending on an off-peak day, like a Sunday or Thursday. Tours can be busy, depending on the season, but numbers are usually well-managed. In summer, most of your experience will be during daylight hours, while in winter, the sun sets in the late afternoon—your experience can be quite different! Mens du er i Rotorua, se en kulturell forestilling og delta i en tradisjonell Maori 'hangi' fest på Tamaki Maori Village. En lokal guide eskorterer deg med buss til 'marae' (Maori landsby) for en avslappende kveld som begynner med en velkomstseremoni av New Zealands urfolk. Lær om lokale skikker og se på en kraftig visning av sang og dans før en hangi-middag. Oppdag den andre verdenskjønnheten på New Zealands Nordøy, fra Rotoruas geotermiske bassenger og Waitomo Glowworm-hulene til Shire på Hobbiton Movie Set. På denne 2-dagers busstur fra Auckland opplever du gamle maori-tradisjoner med en 'hangi'-middag, filmenes historie om' The Lord of the Rings ', en duktur og et besøk til Agrodome. Nyt standard (3-stjerners hotell) eller overlegen (4-stjerners hotell) overnatting i Rotorua. Gå inn i landet for dagen uten å måtte organisere billetter og leiebiler på denne Rotorua dagstur med avgang fra havnen i Tauranga. Besøk en rekke Rotorua høydepunkter mellom avreise og retur, inkludert Te Puia Māori kunst og håndverk institutt. Utforsk Te Puias boblende geotermiske dal, se den eksplosive Pōhutu Geyseren, og opplev en kapa haka kulturell forestilling utført av lokale Māori.